Two Hanukkah Treats with History! By S. R. Hewitt, Jewish Treats. While Jewish holidays are known for their food (except Yom Kippur when Jews fast, of course), most traditional Jewish holiday-related foods are not known for being particularly healthy. Hanukkah is no exception. Forget Passover matzah or Rosh Hashanah apples, those are healthy in comparison--pull out your deep fryer, because Hanukkah is a celebration of oil. Did you know that Homer Simpson’s favorite treat is a traditional Hanukkah delight in Israel? Deep fried dough, most often filled with a pinch of jelly, is how Israelis celebrate the tiny cruse of oil found by the Maccabees. 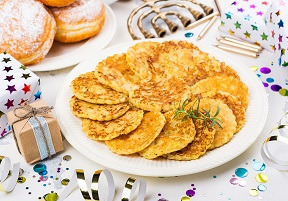 This tradition probably developed from the custom among some Sephardi Jews to celebrate Hanukkah with bimuelos, which are best defined as a type of fritter. Read any children’s Hanukkah book today and you’ll find descriptions of pancakes made of grated potato sizzling away in oil. But, potatoes were only introduced into European society in the 1500s (they originated in South America). Prior to the introduction of the potato to the latke, Ashkenazi Jews celebrated Hanukkah with cheese latkes. Same basic idea, yummy food fried into pancakes. Dairy, however, has its own special connection to Hanukkah. Dairy foods were eaten as reminder of Judith (Yehudit), who, according to tradition, was a beautiful widow who beheaded an enemy general by plying him with cheese and wine until he fell asleep (read the complete story here). Happy Hanukkah. Now get out the griddle and enjoy these Hanukkah treats - and their history - with nieces and nephews! What a great website which have useful articles and posts as well. I really happy to find this website which have that stuff which i can not find in any other website. Actually, I am from uk and finding essay writing services uk. any suggestion about it must be helpful for me. any how Bundle of thanks for sharing this post here. Keep sharing in future as well. Home Expertise Two Hanukkah Treats with History!